The United States is on pace to export more than $2.3 trillion in goods and services this year, representing about 12% of total gross domestic product. With the Trump administration talking tough about renegotiating various trade deals with other countries – or even leaving them altogether – local economies that rely heavily on exports could be significantly affected. 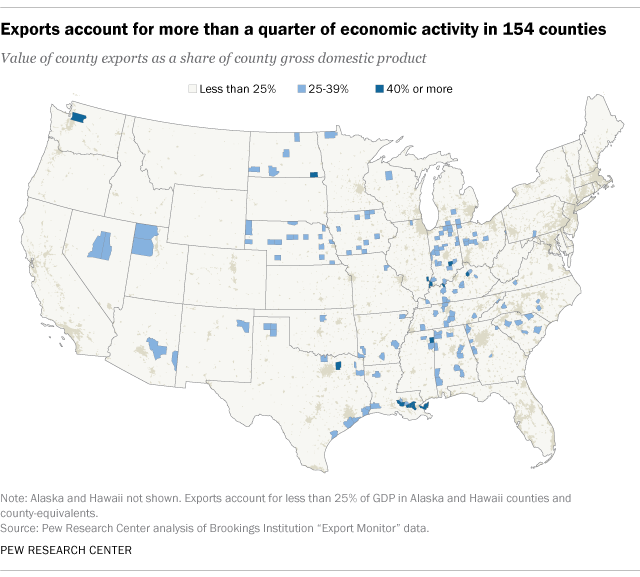 The most export-dependent place in the country was Hancock County, Kentucky, outside of Owensboro and across the Ohio River from Indiana. The county, with just 8,810 residents, produced $420 million in exports last year, equal to 55% of its total GDP. Nearly all of those exports were manufactured goods, with aluminum and other nonferrous metal products the dominant industry. Adjusted for inflation, U.S. exports grew at a compound annual rate of 3.8% between 2003 and 2016, according to our analysis of the Brookings data. (By contrast, overall GDP grew at an annualized rate of 1.8% over the same period.) But booming U.S. oil and gas production and higher precious-metals prices have turbocharged export growth in many resource-rich counties. 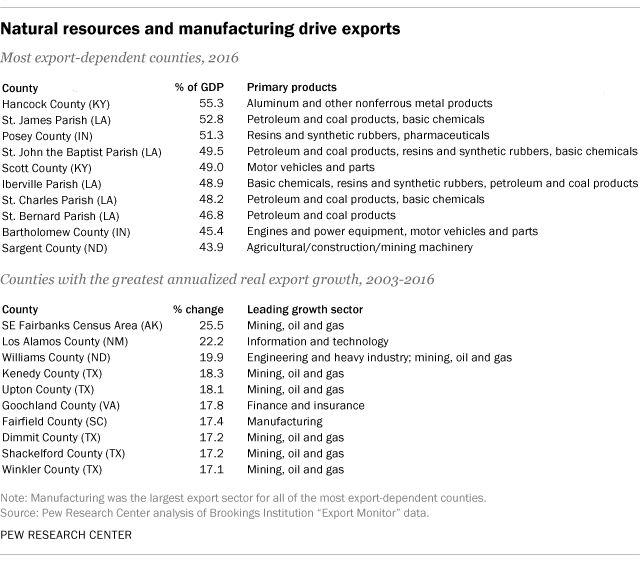 In 17 of the 30 counties with the highest annualized real export growth rates between 2003 and 2016, the economic sector that contributed the most to that growth was mining, oil and gas extraction. That was the case in the jurisdiction with the nation’s fastest export growth in that period: the Southeast Fairbanks Census Area in Alaska, a vast, sparsely populated tract with fewer than 7,000 inhabitants that nonetheless generated $62 million in exports last year, nearly all of them coming from metal ore mining. The area is home to the Pogo underground gold mine, which has produced more than 3 million ounces of the precious metal since operations began more than a decade ago. Canada and Mexico, partners with the U.S. in the North American Free Trade Agreement, are the biggest and second-biggest destinations for U.S. exports, respectively, and they are two of the three largest sources of imports. The Trump administration’s current talks on revising NAFTA come at a time when the deal is considerably more popular in Canada and Mexico than in the U.S. In a Pew Research Center survey conducted in all three countries earlier this year, 74% of Canadians and 60% of Mexicans said NAFTA has been a good thing for their countries, versus only 51% of Americans. More generally, about half of Americans (52%) say free trade agreements have been good for the U.S., according to a separate U.S.-only Pew Research Center survey from April. The survey found a wide partisan gap in public attitudes, however: While 67% of self-identified Democrats and Democratic-leaning independents said free trade deals have been good for the U.S., only 36% of Republicans and Republican leaners did.